Central and southeastern Vermont boast some of the best New England skiing and cross country trails, gorgeous hiking, lakes, and swimming holes, superb theatre, concerts and fairs. Located perfectly between Southern Vermont and Central Vermont, our country inn provides you with access to double the activities! Explore our suggestions for favorite area pastimes, and don’t hesitate to contact us for additional details. Whether you’re a skier or a lodge-lover, wintertime in Vermont is wonderful! Okemo Mountain, less than 10 minutes from our Vermont Bed and Breakfast, offers some of New England’s best skiing, particularly inviting for beginners and families. Within an hour’s drive from the Inn, there are another half-dozen mountain resorts offering great downhill skiing. Award-winning skiing and snow making. Very family friendly. The Free Okemo Shuttle stops by the Inn on weekends. Cross-country skiing and snowshoeing (with lessons and rentals), with onsite cafe. 35 km of peaceful, stunning wooded trails at Viking Nordic Center. Cross-country skiing (with lessons and rentals), snow-tubing, FAT bikes (wide-tire bicycles for snow), dog sledding and onsite cafe. Snow-making machines ensure the best conditions. 30 km of groomed trails, plus 30 km of back-country trails. Dog sledding, sleigh rides, snowshoeing (and rentals) with groomed trails on 100 acres. Snowmobiling is a fun way to take in the stunning winter scenery. Choose from guided tours or unguided rentals: no experience required! Cross-country skiing, snowshoeing, lessons and rentals. Located at the Okemo Valley Golf Club facility. With 140 alpine ski and snowboard trails, this is the largest destination resort in the Eastern United States. Downhill skiing: from learning trails to double black diamond slopes, this small mountain offers the variety of a large resort. Downhill skiing: 66 trails over 230 acres, ranging from easy to advanced. 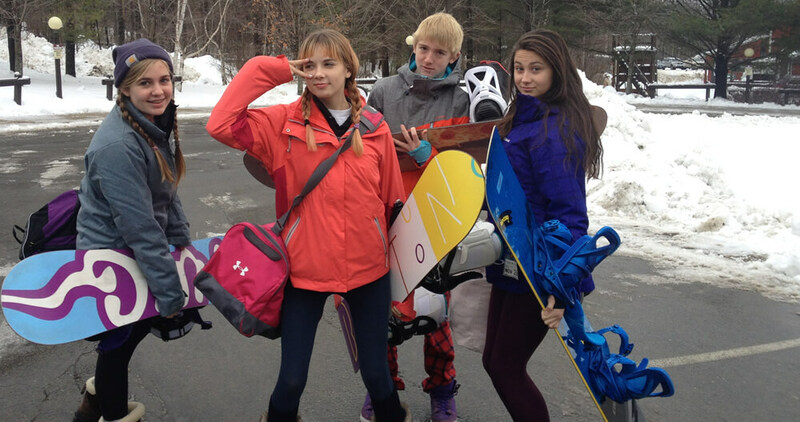 *Buy a 3-day ski ticket from Okemo and use one of the days at Killington, Pico, or Mt. Sunapee. See our Specials page for fantastic “Ski and Stay” discounted vacation getaways. Downhill skiing: 43 trails plus woods skiing, longest run is 1.6 miles. The only New England ski resort with a southern exposure means sunny warmth! 670 acres of skiable terrain; the longest trail is three miles. Finish off your active day by visiting the Aveda Spa at Castle Hill Resort (less than 5 minutes from inn, 1 mile). Enjoy the heated outdoor pool (year round) and fitness center use before returning to the peaceful surroundings at our quiet inn. Discounted passes are available through the Inn. Spring, Summer and Fall are perfect for an abundance of both indoor and outdoor activities. Times shown indicate drive-time from the Inn. 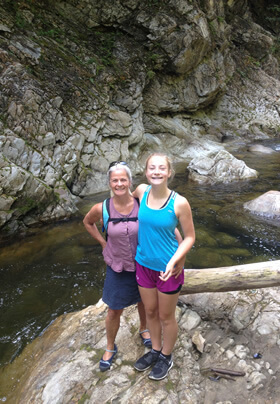 Whether you’re looking for easy, flat hikes or full day mountain hikes, Vermont offers ample beautiful scenery. Both Okemo Mountain’s Healdville Trail and Mt. Ascutney’s Weathersfield Trail offer vigorous, steep hikes for those who want to work for their stunning views. Easier day-hikes include trails at the North Springfield Dam, the Vista Trail at Plymouth Lake, and extensive trails in Marsh Billings Rockefeller National Park. Don’t hesitate to ask your innkeeper for additional ideas. From April through October, Vermont invites you to fish the area’s rivers and lakes. Licenses are required for anyone over 15 years of age, and can be purchased in many locations (including Singleton’s General Store, just a half mile from the Inn). Nearby, the Black River boasts a six-mile “Trophy Trout Stream” section designation, while the lakes in Plymouth (15 minutes from the Inn) offer rainbow, brook, perch, pickerel, bass, and lake trout. With its museum, country store and historic buildings, a visit to this completely preserved village location could last a full day, or just take an hour — it’s all up to you. Guided tours available. This beachfront state park offers canoes, kayaks, swimming, easy hiking, a picnic area, and a snack bar: perfect for families with children or those looking for a no-plans-required kind of day. Requires a small entrance fee per person. In addition to our backyard swimming pool, you can find great swimming at Buttermilk Falls, Camp Plymouth State Park, and Quechee Gorge. Talk with your innkeepers for details. Experience the thrill of an incredible ropes course, mini golf, zip-lining, the Timber Ripper mountain coaster, bungee jumping, and Okemo’s disc golf course at this unique adventure park. Although enjoyed by people of all ages, this may have special appeal for families seeking something for everyone. Tubing on the river anyone? 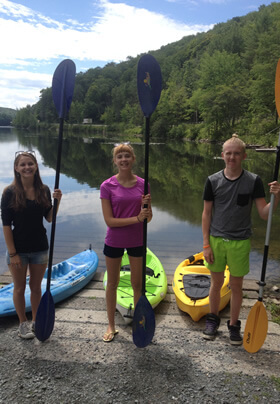 Also kayaking, rafting, canoeing, and a casual stroll through the beautiful and unique Path of Life Garden. Visit their site for rates and seasonal schedules. You may be surprised to find such high quality professional theatre in rural Vermont, but the Weston Playhouse offers a variety of plays ranging from classic Broadway musicals to original one-person shows, and you certainly won’t be disappointed. Every year, the Weston offers a variety of plays ranging from classic Broadway musicals to original one-person shows; there’s surely a show this season for you. Be sure to book your tickets through the Inn as we typically offer theatre discounts. With Vermont’s emphasis on local foods and small business, no wonder there are so many farmers’ markets. You can search the list of Vermont farmers’ markets or just plan on visiting our two favorites: Ludlow Farmers’ Market on Friday afternoons and West River Farmers’ Market (in Londonderry) on Saturday mornings. For the most scenic golfing you’ll ever experience, you can choose from several meticulously groomed courses, all located just a short drive from the Inn. The three closest (and maybe finest) courses in the area are: Crown Point Country Club (ask if we have any golf specials), Tater Hill Golf Club, and Okemo Valley Golf. The long winding roads of Vermont connect one quaint village to the next and they’re some of the most scenic routes you can find in New England. Vermont Vacation offers a comprehensive Bike Route map for the entire state, including the immediate area. You can find 30 miles of maintained trails on Ascutney Mountain and 16 miles in Rutland’s Pine Hill Park or you can purchase a day pass to use the lift-served trails on Okemo. For Bike Rentals, try Tygart Bike Rentals just up the road in Ludlow. Great people, great business. On Wednesday evenings in the summer, you can walk down our street to take in some music at the Proctorsville gazebo. Or on Friday evenings, the venue is a bit larger at the base of Jackson Gore for their Free Concert series. For both, you’re welcome to bring a chair or blanket and some picnic fare. More than just a bird sanctuary, this raptor rehab is part environmental and part educational. Check out their list of exhibits and activities and plan to make this a stop on your road trip. This working dairy farm and historical museum all in one is great for families and anyone interested in witnessing and sometimes participating in farm activities. There is so much happening at the farm that they maintain their own calendar of events, well worth checking out. 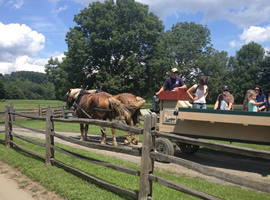 A drive to Billings Farm also complements a driving tour of Woodstock and Quechee. In case you didn’t notice, we’ve listed a whole bunch of activities and attractions up above — some that are great for winter and others for the milder three seasons. Be sure to include them as you gather ideas for things to do in Vermont. The following list of things to do and places to visit in South Central Vermont can be done any time of year. Just a half mile from the Inn, this general store is well worth the visit. Their motto is “Whiskey, Guns, and Ammo” but that barely begins to describe the array you’ll find inside. From potato chips to rifles, from ski sweaters to wine, they have it all. They also have delicious deli sandwiches for your day trip, making this a great stop as you leave the Inn in the morning. This is a small, family operated cheese factory & store. Be sure to check their hours and their cheese-making schedule. If you can stop by while they’re making cheese, it’s SO worth it! Plus, there are tasty samples and you can buy some cheese as travel gifts for your friends back home. If you love Vermont or anything maple, this is a great stop! They offer their own maple syrup, candies and more. Plus they have unique souvenirs and gifts, and a wall of penny candy too! Just five minutes north of the Inn, Ludlow is not only home to Okemo Mountain Resort but also to some great restaurants and unique shops. One of our favorites is The Book Nook, an independently owned bookstore that offers a ‘local authors’ section. We love to shop the Wine & Cheese Depot and there’s a huge beer selection and brewing supplies at Brewfest Beverage. The town also has so many other stores for gifts and art that are both affordable and unique. Home of the renowned Weston Theatre and the original Vermont Country Store. Galleries, cafes, classic river mill, old country stores make this destination well worth a day trip. Better yet, tie in your visit with a summertime show at the theatre — you will not be disappointed. Chester is truly a quintessential Vermont village. You can park in one spot and browse the galleries and shops, of which there are at least two antique stores, an independently owned bookstore, and a funky cafe offering organic whole foods and drinks (Moon Dog Cafe). Pastoral and beautiful, Woodstock offers an active town center with shops and restaurants. While you’re up there, stop by Quechee Gorge for a great view and visit to Simon Pearce for their restaurant and glass blowing demonstrations. Vermont leads the nation for breweries and brew pubs. Here’s a complete map of Vermont breweries, but we’ll list a few that are closest to us and most popular with our guests. Full restaurant, open daily 10 a.m. – 7 p.m. Located with other great businesses in Artisan’s Park, Harpoon and its restaurant is open daily until either 6 or 9pm – check their seasonal hours. Full restaurant with brewery tours on the first Sunday of each month at noon. By August 2016, Trout River should be offering their beers in their new taproom. There are two wineries and one distillery not too far from the inn. This tasting room is located just off Route 91 making it the perfect stop on your way to or from the inn. The tasting room is located in Basketville, a fun little shop in the fun little village of Putney. Summer of 2016 will bring their ‘soft opening.’ By the summer of 2017, they should be in full swing! Contact the vineyard directly for more details or ask the innkeepers. Nestled between Southern Vermont and Central Vermont, our Okemo Valley Bed & Breakfast provides the perfect home base for so many activities and things to do. Our region’s Chamber of Commerce does a fantastic job on their calendar keeping track of immediate-area events. No matter what season you’re traveling, be sure to see what Okemo Mountain Resort is offering. All of their posted events are open for all to join in the fun. When the weather is right, don’t hesitate to expand your search and consider villages like Manchester, Woodstock, Brattleboro, and Hanover (NH). All are just 30–60 minutes away, and the ride is typically so beautiful it becomes part of the fun! Check out these Events Calendars at VacationVermont.com and Vermont.com. Don’t forget that at Golden Stage Inn, we partner with Goodman’s American Pie of Ludlow and we host the Vermont Golden Honey Festival every year on the second Saturday of September.